Extreame Savings Item! 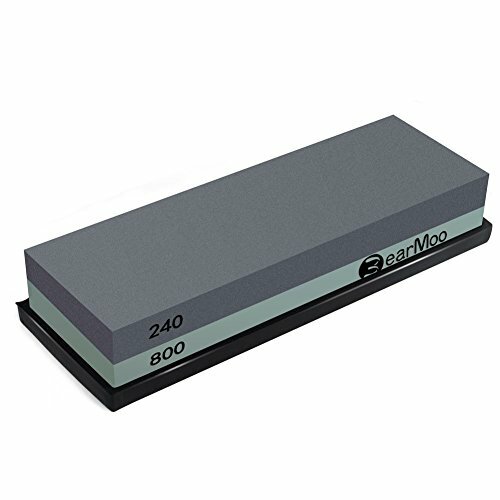 Save 47% on the BearMoo Whetstone 2-IN-1 Sharpening Stone 240/800 Grit Waterstone Knife Sharpener, Rubber Stone Holder Included by BearMoo at Enria Industries. MPN: SS04. Hurry! Limited time offer. Offer valid only while supplies last. -- What could we do when our knives or tools are dull or even chipped? -- Don't worry, BearMoo sharpening stones can help you solve this problem. -- Don't worry, BearMoo sharpening stones can help you solve this problem. This coarse grit is highly recommended for very dull edges on knives and tools. Whether you're refining a worn edge or establishing a new bevel angle, the coarse grit is the grit accomplish this task. This grit is a very good overall grit. It is fine enough for many jobs and still have enough abrasive properties to do sharpen knives and tools that are not very dull. If you keep your knives and tools in good shape, you'll find yourself reaching for this grit level often. This grit is also very common for the final stage for many kitchen knives. 3. Then use the #800 grit side for fine grinding. This process takes about 10 minutes. 2. Do not use whetstone to sharpen serrated blades. ★ Thick, Solid and Large Whetstone: Made of professional grade white corundum, perfect for the larger chef's knives, gives a nice working area for any size of knif, corrosion-resistant, heat-resistant, edges and corners are clearly demarcated. ★ 2 Grit Sides Ensure Best Sharpening: 240 grit side is best for damaged edges, very dull edges or chipped edges, very fast metal removal, leaves visible scratches in cutting edge. 800 grit side leaves metal edge with frosted appearance. Edge sharpness equivalent to majority of factory edges on knives, tools. ★ Suitable for Most Grinding Operations: Kitchen knives, hunting knives, kitchen shears, pocket knife, Shun chef knife, porting knives, straight razor, cutting class knife grinding, precision tool, garden tools, art appliance and ceramic knife, but EXCEPT serrated blades and ceramic knife etc ( please kindly follow the coming user guide ). ★ Safety Guarantee with Silicone Mat: The non-slip silicone base eeps the stone firmly in place, amazing experience without without moving at all. ★ Satisfaction Guarantee No Risk: We're sure you're going to love this whetstone, try it out today without risk. If you're not satisfied with the sharpening stone for whatever reason, just contact us within 30 days for a hassle-free full refund, no questions asked. If you have any questions about this product by BearMoo, contact us by completing and submitting the form below. If you are looking for a specif part number, please include it with your message.